Username Password LoginForgot your password? 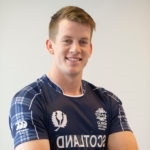 OL George Munsey helps take Scotland to cricketing victory over England! Click here to read the article in the East Lothian Courier.